Two Trees Catering is a unique full service catering company; we specialize in offsite events with fully mobile capabilities. 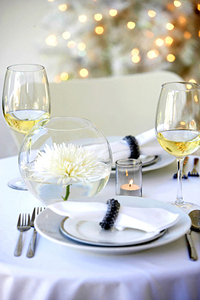 Our experienced and knowledgeable staff can help you organize a perfectly-executed catered event. Whether you are planning a corporate function, business engagement, wedding reception, social function, or, if you need on-location catering for the film industry, we can help you through the challenges of creating a truly memorable occasion. Located in the beautiful Blue Ridge Mountains in Floyd County, Virginia, we draw from the plentiful, local purveyors and surroundings for inspirational food with a global flair. Two Trees has fully–mobile catering capabilities, allowing us to provide you with the freshest possible foods. At Two Trees, you will find honest, reasonable rates, always incorporating innovative presentation with a personal touch and professional service. Because we are an established veteran of the event production and catering industry, our resources and capabilities are endless. Whether we are simply providing food for an office event or producing a wedding or fundraiser for 500 guests, you can count on amazing food. Our menu selections are as diverse as our clients are. Constantly satisfying clients from around the globe and here at home, we custom fit each and every menu according to your group's wants and needs. Our menus are as simple or complex as you wish them to be. Vegan, vegetarian and special dietary needs are always taken care of and are a specialty of Two Trees. We use only the freshest available ingredients from local growers, purveyors, and whole markets. Your event will be provided with healthy and fresh food each and every time. Two Trees Catering is chef-owned and operated by Adam Morrison, a working chef of over 20 years with experience in all aspects of the restaurant and catering industry. We are blessed to be a part of a community so supportive and beautiful and we at Two Trees would be honored to cater your next special event. Two Trees welcomes free tastings at our location in beautiful Floyd County. We look forward to hearing from you. Please call or e-mail us with questions or for a quick quote.